Great Bend, KS - DesignWraps BrandsTM, the world leader in superior quality Made in the U.S.A headwear has announced the addition of the “Road Warrior HeadGear” 2-Pack. Marketed under their RidersWrapsTM brand line of products, the Road Warrior HeadGear pack containing two of their top-selling headwraps, was developed to better assist the dealers with sales and profits and to give the riders what they want...functional all-weather headwraps. The headgear styles featured in The Road Warrior Pack™ are designed specifically for today’s riders to combine comfort and function with good looks for the rider who has made the road their middle name. • The 1st – made from CPL (Cotton/Poly/Lycra), is RidersWraps #1 most popular wrap and their top-selling fabric. This fabric will not shrink, pill or fade and gets softer and more comfortable after every washing. This truly is the perfect headwrap for every riding season. • The 2nd wrap, made from their famous SoftSpunTM Perf fabric, is constructed with a dual purpose blend of polyester and Lycra. This wrap will keep the rider cool, dry and comfortable with added odor control … A motorcycle headgear winner. Both RidersWraps styles offer a firm 4-way stretch for total comfort and fits your head perfectly…every time you put it on. RidersWraps FirmStretchFitTM technology creates a wrap that provides a totally comfortable and irritation-free fit! These styles will ultimately determine your comfort level, whether you are wearing a helmet or riding free in the wind. Looking for the ultimate in function and comfort? RidersWraps™ are the perfect choice. 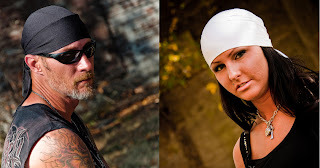 • RidersWrapsTM…Serious motorcycle headgear for men and women riders. • Wraps of HopeTM…Headwear with flair, perfectly designed for all women. • Savvy ThreadsTM…Reality-sized apparel, dazzling the women’s motorcycle market with a wide variety of ornate designs on body styles that fit all women. As with all DesignWraps Brands, RiderWraps uses only the finest quality materials and fabrics available. Joan has devoted her life to supporting the American Dream and the desire to create and keep jobs right here in the good ‘ol USA! DesignWraps Brands is the perfect collection of motorcycle headwear, driven by the motorcycle culture and inspired by those that ride and the lifestyles they live both on and off the road. Road Warrior Headgear Pack MSRP: $44.95. As with all RiderWraps products…there’s free shipping on orders of $89 or more and every customer gets a $10.00 discount when buying merchandise worth $200.00 or more. Know of a woman or child suffering with cancer…RidersWraps will always give a FREE WRAP to a woman or child suffering from hair loss due to their illness! For those interested in obtaining more information on RidersWraps New Road Warrior HeadGear email them at sales@designwraps.com or check them out online at www.designwraps.com.